PBS NewsHour Executive Producer and SVP Sara Just, .Mic Executive Editor Madhulika Sikka, and New York Times Associate Managing Editor Marc Lacey with moderation by PBS NewsHour correspondent and Weekend Anchor Hari Sreenivasan will discuss the importance of diversity in all aspects of reporting. 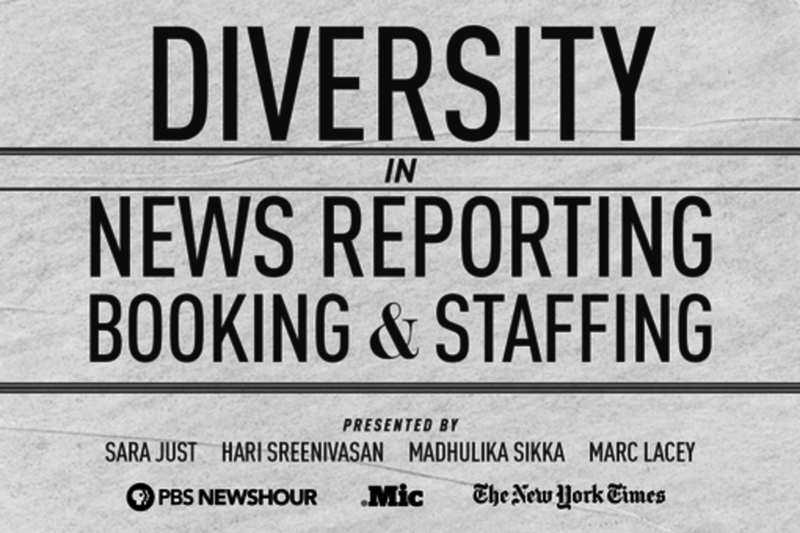 Hear how these professionals are making a conscious effort to bring diversity to the newsroom and broadcast, in the topics discussed and reported on, the voices brought in to provide analysis and commentary and in staffing both on-camera and editorial talent. Hari Sreenivasan is the Anchor of PBS Newshour Weekend and a Senior Correspondent for the nightly program. In addition, Sreenivasan also serves as the Director of Digital Partnerships helping guide the digital strategy of Newshour's online endeavors. Previously, he ran his own production company and freelanced as a reporter for KTVU-TV in Oakland, California. Sreenivasan served as an anchor and senior correspondent for CNET Broadcast in San Francisco and was a reporter for WNCN-TV in Raleigh, North Carolina. I'm an editor at The New York Times. Sara Just became the executive producer of PBS NewsHour and Senior Vice President of WETA in September 2014. Just was selected to lead public broadcasting’s nightly national newscast, and its digital and social media content, as the NewsHour nears its 40th anniversary on the air. Just came to the program after more than 25 years at ABC News. In recent years, she served as ABC’s Washington Deputy Bureau Chief and Senior Washington Producer for Good Morning America. She previously spent 17 years at Ted Koppel’s Nightline. She led ABCNews.com’s political coverage over two presidential campaigns, 2008 and 2012, where she also supervised the development of political online products and partnerships. Just is the recipient of nine Emmy Awards, two duPont Silver Batons, two Peabody Awards and an RFK Journalism Award, and she is a three-time Webby Official Honoree. A native of the Boston area, and a graduate of Columbia University, Just lives in Maryland with her husband and two sons.